duck, duck, duck, duck, duck, duck, duck, duck, duck, duck, duck, duck, goose!!! Did you see the goose??? Oh this is really a great shot of a flock in action!!!! PS - no, where is the Gooses? If there is a goose inthere, my best guess is at the very bottom in the center of the photo. Slightly left of center that is. By the way--You were right VP. The goose is the big blob touching the botom of the screen, just left of the center of the photo. He's a little tough to see, because his head is hidden. I might not have noticed him either if I hadn't spent 100+ days a year for the last nine years, watching, photographing, and hunting them. Do you know where they do that sort of thing. I have seen it before, but I have no idea what companies might do such a thing? 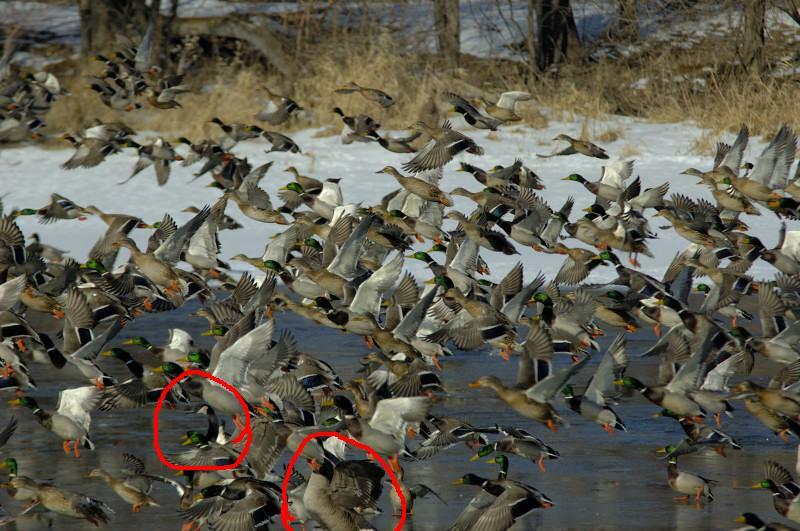 Nice flock shot Tom, I think you have 2 geese, the one you say has his head hidden and one where his body is. I will remove this pic if you want, I have deleted it from my HD. Those are two places I found doing a quick search, I have not used either, use at your own risk. Maybe that's the other one's head???? I love the colors and the action. I think I found another goose. Though, admittedly, not the kind of goose you were thinking of. That front duck has his head down like he is trying to accelerate. [img]/forums/images/emoticons/sprachlos020.gif[/img] Can't blame him.